Home » »Unlabelled » 2017 is The Year of Kali, Goddess of Endings & Beginnings. 2017 is The Year of Kali, Goddess of Endings & Beginnings. At the turn of 2017, I decided it was time to call upon Goddess Kali to assist with various aspects of my life that urgently needed a complete and radical overhaul. Throughout 2016, I had picked up a variety of negative and unhealthy habits, beliefs, emotions and feelings, including a few entanglements with people who really didn’t have good intentions for a friendship or who did not hold my best interests at heart. I knew that the time had come to let go, however, I also knew it was not going to be simple or straightforward and that I was likely going to cling to them unless I called in some divine intervention. I asked for Kali’s assistance because I have absolute faith in her ability to discern what is going on with me. I allow her to remove negativity and what is no longer needed, and to leave what is positive, healthy and sill serving. The moment I called in Kali she abruptly appeared and, in all honesty, the last couple of weeks have been traumatic at times, which is why it has taken me two weeks to complete this piece of writing. I have been forced to see that many things that I believed to be true in my life were quite simply illusions. However, I wouldn’t ask for it any other way and I am grateful to Kali for showing up as soon as I called her and for loyally remaining at my side as once-important parts of my life disintegrated before my eyes. Although this shedding of the old has been a turbulent and chaotic experience, it was also filled with love and blessings—and most importantly, it shifted and removed some of the things I knew I did not have the strength to eliminate on my own. A Kali goddess cleansing is not for the faint-hearted and I would only suggest it to someone who is truly ready to let go of old, stagnant energies that have been weighing them down and causing suffering, as Kali’s energy is intensely powerful right now. The cleansing will unleash a much-needed, unstoppable storm that will not slow down until the detoxing of everything harmful in one’s life is over. It is also vital to remain surrendered to Kali’s power throughout the entire cleansing process as she does not only destroy, she also creates, so it is essential that she is given the space she requires to complete the purpose she has been called upon to do. 2017 is a “1” year in numerology (2+0+1+7 =10) (1+0=1) and the number 1 signifies new beginnings. Therefore, now is the time to energetically move toward letting go of the old and getting ready for a brand new start. The number 1 represents the energy of rebirths, fresh starts and brings with it powerful momentum and movement when it comes to new ideas, inventions, and creations. 2017 has a very different energetic vibration compared to 2016. While 2016 was all about endings, 2017 is a “1” year in numerology which marks new beginnings, exciting new opportunities and possibilities. However, these will only arrive if we are willing to fully let go of the past and if we are open to receiving the wonders of the present moment, as well as the future. The intentions, actions, and deeds we are choosing to focus on now, especially in the earlier part of 2017, will set the tone for what we will attract, create, and experience over the next nine years (numerology years run in nine-year cycles). The most important themes during a “1” year are flexibility and resilience so that we are mentally, emotionally, and physically able to effortlessly accept and adapt to the continuous change that is constantly floating our way. 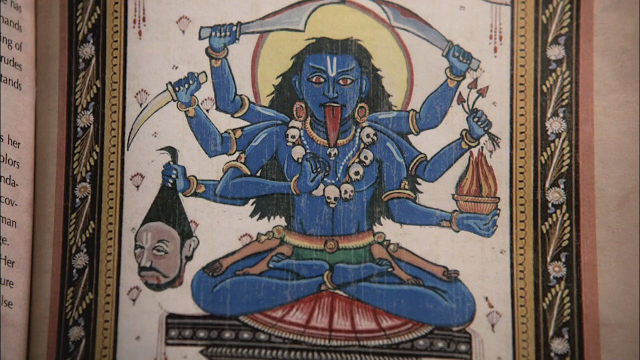 Kali is one of the most powerful, but misunderstood, Hindu goddesses. She is the embodiment of Mother Nature, the goddess of life, death, transformation, destruction, endings and beginnings. Kali, whose name means time, quite forcefully pushes us out of our comfort zone by creating storms and lighting fires to cleanse the old and make way for the new. The turbulence can be unnerving at times, however, ultimately it causes dramatic shifts in our lives that empower us to reach our full potential. This goddess carries a sword of knowledge along with a severed head that symbolizes the ego. These depictions express Kali’s ability to slice through delusions so that we are freed from society’s limitations and conditioning, and they also release us from anything that we have been blindly bound and tethered to. Kali opens our eyes so that we see our situations with clarity and she gifts us the insight to firmly make decisions, let go of fantasy and move toward the truth. Kali is wild and untamable and she terrifies some, particularly those who are threatened by strong, independent, fierce, dominant, determined feminine energy. This goddess does not bow down to societal demands and expectations, she has her own moral code and ethical standards and she asks us to let go of any preconceived notions that we may have previously held about how we hoped or expected things should be and she asks that we keep our mind positive and hopeful for the best possible outcome. She comes along and shakes us vigorously so that we have no choice but to accept that there are aspects of our existence falling apart at the seams and that we have tried to cling to for far too long. Kali brings with her a—sometimes painful—awakening to our true selves and illuminates everything false around us. This allows us to come to the realization that many things in our lives have been illusions and that we have the ability to sever ties with anything or anyone that is inauthentic. We can call upon the energies of Kali at any time throughout 2017 and allow her to support us as we transition into this new cycle and year and find freedom and fulfillment as we release everything from the past. It is important to remember that when we are asking for this goddess’ assistance that we try not to tell her what it is we need. We must have faith in Kali’s divine intervention if we are to get the results that serve our highest good. Even though at first we may not fully understand why certain things are beginning or ending, Kali is wise, compassionate, intuitive, loving and fair and she holds our best interests at the center of her heart. Kali encourages us to trust in the process and accept universal order, despite how challenging it may feel. Often we want to hold on to people, beliefs, habits or circumstances, even though they are unhealthy and dysfunctional, simply because they feel familiar and change can feel difficult, unsettling and chaotic. The hardest ones to let go of are those that cause us to repeatedly question, “What if?” However, these are often some of our most limiting circumstances and ones that cause us to remain in the past, wishing things were different. It is essential to keep letting go and trusting that whatever is meant to be will come back around again if it has a place in our lives. Endings are a natural part of the circle of life and, when we fear them, we remain stagnant and halt our own unique evolutionary dance. Everything is energy that constantly vibrates; it is simply not possible for anything to eternally remain exactly the same. When something changes and comes to an end, it just means room is being created so that something exciting and new can begin. Often what seems to be a loss is actually the start of a beautiful new phase in our lives. Everything is happening exactly as it is supposed to and when we fear the change and cling to the attachment of what feels familiar, we just cause our own internal suffering. Calling Kali is almost like jumping into the deep end of the pool. Swimming against the current won’t serve us and neither will it serve anyone around us. We must have faith and allow Kali to come along with a big, wide broom and sweep all of the dirt and dust away to freshen up our lives so that they are cleansed and inviting for brand new beginnings to enter. Throughout this year we will find the courage to release our attachment to anything or anyone that causes us harm in any way and in doing this, we create space to invite new and positive experiences. Although many fear Kali’s drastic approach, when we really feel into this Goddess’ energy, we truly see that the only thing to fear is fear itself. Kali will walk alongside us through the darkness as we bravely tread on the ground that we have been too scared to wander before. She will remain with us so that we are not tempted to flee from whatever has been haunting us and keeping us repeating harmful relationship patterns. In venturing beyond our fears, we gain the opportunity to see things in a new light so that we can then unhook ourselves from anyone or anything that has been holding us hostage due to oppression or fear. We can then go through a dramatic transformation and surrender to Kali to allow her natural healing powers to cleanse, revitalize and renew us. One thing for sure is that Kali unconditionally loves and protects all of those who have faith in her and those whom she takes under her wing. She will be there while all hell breaks loose and she will rise as the calm breeze signaling the storm is over. At certain times it may take every ounce of trust we have left in us to surrender to this Goddess so that her love, wisdom and knowledge can guide our transformation, but when we have gone through the transformation there will be no doubt that she was moving through our lives with care and precision, despite how ruthless it may have felt. In 2017, there are various key dates when we can call in Kali’s energy to assist us with letting go and starting over. 2017 is a year for transformation and heightened levels of love and with Kali’s assistance we can move through it revitalized with fresh energy, and with a renewed sense of excitement and adventure. Most of all, we can transition through with love in our hearts and a deep feeling of peace and harmony in our souls as we let go of all that causes unhappiness and that is no longer necessary in our lives and make way for an abundance of beautiful new beginnings.